Arkansas is home to more than 40 four-year universities and community colleges. These schools offer a sprawling list of majors, minors and technical degrees, and the state's colleges boast programs that will interest every kind of student. To find the right school for your academic interests, you'll need to consider the education costs, academic programs, financial aid and a number of other factors in all of the schools you're considering. 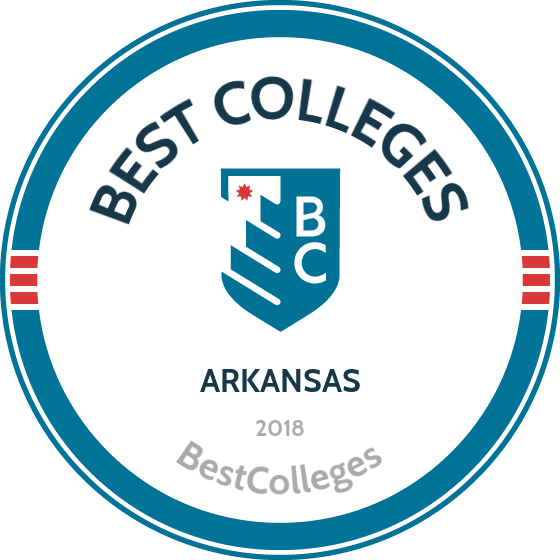 To help, we have ranked the best colleges and universities in Arkansas. To provide a robust list, we've examined all of the factors students value when looking at schools. Key measures include acceptance, retention, graduation and enrollment rates. We've also included the student loan default percentage at each school, as we know it's important for students to repay their debts after graduating. We have applied our rigorous methodology to the latest education data to rank the best colleges in Arkansas, including the top four-year and two-year schools. There are 24 four-year institutions of higher education in the state of Arkansas, from major research universities to liberal arts schools to bible colleges. With a range of private and public options and an array of degree programs throughout the state, Arkansas's schools offer something for everyone and provide an opportunity for students with a range of academic interests to pursue their academic and professional calling. Below, we've ranked the best colleges in Arkansas. Using our proprietary algorithm, we've determined the best schools in the state, and if you're interested in attending college in Arkansas, our list is an excellent place to begin your research. You'll find a brief overview of academic strengths, as well as a rundown of life on campus and a few interesting facts about each school in its profile. University of Arkansas, or the U of A, offers more than 70 bachelor's degree programs in colleges and schools with more than 200 academic programs and innovative options like a BS in biological and agricultural engineering, a BS in agriculture in food science, or a bachelor of interior design. Students who qualify for U of A's Honors College benefit from opportunities to connect with 3,000 other high-achieving students and 700 top faculty; small class sizes; special housing; access to study abroad and research grants; and eligibility for one of several esteemed fellowships. UofA is recognized as one of the best colleges in Arkansas and classified by the Carnegie Foundation among the nation’s top 2 percent of universities with the highest level of research activity with more than 50 centers for research and outreach on campus. Undergraduate students are encouraged to pursue a research topic of interest, and students' research findings are published bi-annually in UofA's Inquiry journal. The U of Awas founded in 1871 as a land-grant institution in Fayetteville, which overlooks the Ozark mountains. More than 27,600 students from all 50 states and 120 countries enroll at U of A each year. Arkansas State University's (ASU) HLC-accredited programs include degrees across six distinct colleges in the arts, sciences, health science, and education fields. ASU's College of Nursing & Health Professions maintains affiliate relationships with over 500 health facilities in the region, from hospitals to private practices to government agencies. The university's newest college of Liberal Arts & Communications was established in the fall of 2016, and students can now choose from a diverse set of degrees across art & design, criminology, world languages, music, and several more. The university library houses an extensive collection of over 1.5 million books, federal and state documents, and microforms, as well as an Archives and Special Collections area. ASU is also the first university to open a comprehensive campus in Querétaro, Mexico, with classes starting in 2017, and effort that sets it apart as one of the best colleges in Arkansas Students on the AZ and Mexico campuses will have the opportunity for interchangeable study at both locations, opportunity to master a second language, and explore relationships with international companies. Harding University offers 10 undergraduate programs with multiple bachelor's degree options and 14 undergraduate pre-professional programs across its nine schools, including an Honors College. A diverse set of program options include a BS in fashion merchandising, a BA in broadcast journalism with an optional off-campus experience at the Los Angeles Film Studies Center, or a BS in biomedical engineering. Harding's seven international programs also allow students the opportunity to study abroad for a semester in places like Paris, Zambia, and Florence. A special Scholars Abroad program for freshmen students sets Harding apart from other Arkansas colleges. Freshmen who choose to take advantage of the program receive an inclusive study abroad experience complete with housing, meals, and opportunities to give back through a local church. Harding is recognized as a military-friendly university by the Arkansas State Approving Agency for Veterans and accepts all veterans benefits. Social media gurus can connect and interact with Harding through its multiple social media outlets, including Instagram, YouTube, Twitter, and many more. With a curriculum rooted in the liberal arts, John Brown University's (JBU) major programs span the arts, humanities, and physical and life sciences; degree options include art & illustration, Christian ministry & formation, and entrepreneurship. Student athletes and sports fans will find top-notch intercollegiate athletic teams, as well as club sport and intramural programs. The university campus features a 5-mile mountain biking trail that runs along Sager Creek. Students who prefer the arts will find a range of performance opportunities with Music Theater Workshop, Jazz Ensemble, a variety of choirs, and more. John Brown's Leader Scholars Institute, a unique feature amongst Arkansas colleges, is a four-year, co-curricular program that brings together high-performing students and helps shape them into strong leaders in their field and as representatives of their Christian faith. JBU students have a reputation for academic excellence, and former students have included a Fulbright Scholarship winner and a team of students awarded the NASA Innovation Award for multi-robot design. Arkansas Tech University makes the list as one of the best colleges in Arkansas, providing a full set of bachelor degrees and a wide range of concentrations available in business and education. Degree programs are also available in the arts & humanities, health sciences, engineering, and the applied sciences. Students pursuing a bachelor's in education can hone their expertise by choosing to also complete an endorsement in special education or in dyslexia therapy. An innovative business analytics degree prepares new leaders to creatively solve problems using cutting-edge data analysis strategies. A dedicated International and Multicultural Student Services Office provides support services for a diverse and global student body. Arkansas Tech students have the opportunity to participate in Global Connect and mentor an international student. The university also offers a Bridge to Excellence Freshman Mentoring Program, which pairs incoming students with volunteer staff who serve as mentors during students' first semester. University of Central Arkansas (UAC) offers a choice of 84 bachelor's degree programs across the arts, sciences, education, and business, with options like a BS in addiction studies and prevention, a BA in digital filmmaking, or a BA in telecommunications. UAC's list of minors is one of the most extensive offered by colleges in Arkansas, and allows students to further customize their study with options that include Asian studies, physics, writing, and many more. Students can get involved on campus through one or more diverse clubs and organizations. The Bear Den, a student-organized sports and school spirit organization, coordinates pep rallies, tailgate parties, family day activities, and other events.Other opportunities for involvement include but are not limited to Colleges Against Cancer and Relay for Life, the Food Recovery Network, and the Ultimate Frisbee Club. Student leaders who don't find an organization that fits their interests also have the option of creating a new student group. Ouachita Baptist University offers a diverse range of liberal arts-based undergraduate degree programs, with new degree options in community and family services and a minor in legal studies. Whether seeking a career in business, Christian studies, the media, architecture, health or another field, students are bound to find a program that matches their career interests at one of the best colleges in Arkansas. A full set of pre-professional programs include degrees in optometry, public administration, law, and several more. Undecided students have the option of participating in Ouachita's Discover program, designed to help students discover a best-fit career path through resources that include online assessments, a scholar guest and leadership series, career services, alumni network connections, and more. Ouachita is also a leader in ESL programs, offering ESL-friendly courses for students with limited English skills and a path for transition into a full bachelor's program of study. Central Baptist College is one of several highly-ranked colleges in Arkansas that offers a Christian-based liberal arts education. Students can choose from 37 bachelor's degree programs and a wide range of minors spanning the sciences, business, Biblical studies, education, and the arts. All programs are accredited by the Higher Learning Commission and range from the classical, such as a BA in English or history, to more cutting-edge options like a BS in the molecular biosciences or a BA in multimedia communications. The college was founded in 1892 and operated until 1947, before laying dormant for five years until its revival by the Arkansas Missionary Baptist Association. The campus is now home to more than 700 students and 55 full-time faculty members. Students can find everything they need while living on campus, including counseling services, campus safety resources, chapel and spiritual events, a student health clinic, and more. The Student Activities Board sponsors and coordinates a variety of study activities throughout the year, including themed parties, movie nights, and sports events. Located in Conway, Arkansas, Hendrix College is a private liberal arts college that takes pride in all of its campus traditions, from student birthday celebrations to its epic Shirttails dance competition. The college's 34 majors and double majors in the arts and sciences offer a study path for almost every student, with options that include environmental studies, neuroscience, and theatre arts. First-year Hendrix students participate in The Collegiate Center, a general education curriculum that includes interdisciplinary courses that prepare students with the skills and knowledge to develop into global citizens that engage with the community and clearly articulate opinions and arguments through discussion and through writing. This entry-level program is the only one of its kinds amongst all colleges in Arkansas. A new Murphy Scholars program also offers sophomores and upper-level students advanced study in literature and language, with perks like a study abroad travel fund; the chance to meet and talk with visiting distinguished writers, editors, and translators; and completion of an off-campus experience that involves giving back to the community through language or literature. Southern Arkansas University offers a range of bachelor degrees through its five colleges, including business, education, liberal and performing arts, science and engineering. Each college offers a diverse set of tracks, including counseling or kinesiology through the school of education and foreign languages and design via the liberal arts school. A diverse set of performance- and academic-based scholarships are available to freshmen, transfer students, and nontraditional and upperclassmen. SAU's modern facilities help set it apart from other colleges in Arkansas. The Mulerider Activity Center, for example, features fully-equipped fitness and recreational rooms and spaces for intramural sports group, while a 78,000-square-foot rodeo-style arena hosts annual rodeo events attended by students and the community. A state-of-the-art community center also offers plenty of technology-equipped spacious meetings rooms, a grand hall, and more. SAU implements action projects each year to continually improve its campus facilities and resources, with current projects addressing information literacy amongst students and data-informed decision-making by faculty. University of Arkansas at Little Rock (UALR) provides a set of unique bachelor's degrees that include a Bachelor of Professional Studies, a Bachelor of Music, and several more. Students in any program have the option to select from one of several concentrations; for example, those seeking a BA in art can choose from an emphasis in art history, art education, or studio art. UALR also offers pre-professional programs, including pre-pharmacy, pre-medicine, pre-veterinary, and others. The university's public radio station is an affiliate of NPR and also offers internship opportunities for students in media-related programs. UALR alumni take pride in their experiences at one of the best colleges in Arkansas, and many choose to become members of the Alumni Association, which offers a long list of on-campus, entertainment, shopping, and insurance benefits and discounts. Alumni and students alike attend UALR's Trojan athletic events, which include men's and women's basketball, golf, track and field, and more. A state-of-the-art athletic performance center provides top-notch training equipment for all student athletes. Recognized as one of the best colleges in Arkansas, Henderson State University offers 46 undergraduate and 13 graduate degrees, with majors spanning the arts and media, business and education, health sciences, and more. Innovative degree options include a BS in biochemistry, a BS in aviation with professional pilot certification, a BA in Spanish education, and many more. Students find their place in the campus community through over 90 clubs and organizations, ranging from community service organizations to recreational sports to social fraternities and sororities. Departmental organizations include the student-run Henderson TV and The Pulse radio station. Henderson students and athletes represent the “Reddie” mascot, a nickname that stemmed from the original (and nameless) football team's red jerseys at the turn of the 20th century. The college takes pride in Reddie spirit, which it believes is represented by one crucial event: after a fire ravaged the college in 1914, a group of Henderson students came together to rebuild the school. The courage and activism reflected in this act are qualities that Henderson strives to encourage in all of its students. Williams Baptist University's Campus Ministries are at the heart of the university, offering Christian-centered communities with small and gender-specific prayer groups, chapel services, mission trips, and more. Students can choose from over 25 programs of study in the arts and sciences, education, Christian ministries, and business. A variety of degree choices include a BA in communications with an emphasis in speech and theater, a BS in biology, or a BA in youth ministry. All degree programs feature a Christian-based curriculum. Courses are kept small, with an average of eight to 12 students per class and ongoing opportunities to meet one-on-one with professors. Both first-time and transfer students may be eligible for one of several full-tuition scholarships, a unique offering in our top-ranking list of Arkansas colleges. Most of Williams' student body, numbered at 600 and growing, lives on the main campus in Walnut Ridge, Arkansas, which is about a 90-minute drive from Memphis, Tennessee and two hours from Little Rock. The second-oldest land grant institution amongst Arkansas colleges, University of Arkansas at Pine Bluff acquired its university status in 1972. A 15:1 student-to-faculty ratio creates a close-knit learning environment amongst a culturally and economically diverse population. UAPB's University College serves as a gateway for incoming freshmen, providing support programs, orientation, career exploration, and other services in order to help students make a successful transition into their college experience. Undergraduate majors are available in a wide range of study areas across four dedicated schools, which includes an honor's college. The School of Agriculture, Fisheries, and Human Sciences, for example, equips students with the skills needed for in-demand careers like aquaculture managers or precision agricultural technicians. Several of UAPB's departments also maintain partnerships with leading industry companies and organizations, including the computer science department, which has strategic connections with the USDA, the IRS, the FBI, and many other leading organizations. Originally established as a junior college in 1928 with just 34 students, University of Arkansas at Fort Smith has grown to more than 6,700 students and in 2002 became one of a group Arkansas colleges that are part of the UofA system. Students can choose from a variety of bachelor's degrees in the arts and sciences. Innovative options like animation technology and imaging sciences are offered alongside professional programs such as organizational leadership and international business. High-school students looking to get a headstart on their college career can apply for dual enrollment at UAFS. Graduates of UAFS have a 100% record of finding full-time careers or being accepted into graduate school after graduation. An 18-to-1 student-professor class ratio allows for more meaningful class discussions and a chance for teachers to get to know students as individuals. Freshmen scholarship recipients are invited each spring to attend a UAFS Scholars Day that is held in collaboration with the Undergraduate Research Symposium, offering students the chance to explore unique research avenues and projects. Lyon College professors are some of the most respected in their field and about 93% hold a PhD or higher. In addition to pre-professional programs in education, law, ministry, journalism, and health care, students can choose from BA and BS degrees in 15 areas of study. Students also have the adoption of developing an individualized program of complete two majors as one degree with the approval of their academic committee. The college's multiple Upward Bound programs, including an Upward Bound Math-Science program, provide first-generation college students who are pursuing a STEM degree with engaging opportunities like field trips and mentored research projects. Lyon is one of the only Arkansas colleges to have formed a program that takes full advantage of the activities made possible by its diverse natural setting in the Ozark mountains and bordering the White River. In addition to a fully-equipped campus with a climbing wall, hiking and biking trails, the Lyon Education Adventure Program offers students off-campus outdoor trips that cover everything from caving to paddling to rock climbing. University of the Ozarks has two of the most unique, innovative and personalized academic programs in the region. The Learning Environment for New Synthesis (LENS) program offers a blended and customized curriculum and allows students to graduate with a major and two minors from each of three "lenses," or areas of study: the humanities and fine arts, social sciences, and natural sciences and mathematics. This personalized and interdisciplinary approach to education cultivates the development of well-rounded and adaptive skills in an ever-changing and evolving workforce. In addition, the university’s new Compass program is a comprehensive and integrated digital learning initiative that provides universal access to a common set of learning technologies. This program fosters an environment of innovation, creativity and discovery throughout campus. Founded in 1834, University of the Ozarks has a long and rich history as a trailblazer in higher education. The oldest university in the state, Ozarks was also the first to admit women (1871), the first predominately white university in Arkansas to admit African-Americans (1957) and to integrate athletics (1963), and one of the first university’s in the nation to implement a dedicated program for college students with learning disabilities (1971). Ecclesia College is unique amongst colleges in Arkansas for its focused degree offerings in ministry, Christian leadership, and Biblical studies. BS and BA degree programs are also available in a handful of other fields, including business administration, communication, psychology, or sports management. All programs are built upon the college's Biblical-based curriculum and incorporate a spiritually-supportive learning environment. An emphasis is also placed on servant-leadership, and all students are provided with opportunities to work and support local churches or minister around the world in places like China and Mexico. Ecclesia is one of seven U.S.-based colleges to a offer a work-learning program, which provides students with the opportunity to work and learn alongside campus staff, while earning funds to put toward tuition costs. Ecclesia performance-based scholarships are also offered to outstanding students each year. The college's small but inviting campus is located in Northwest Arkansas on about 200 wooded acres and features family-style dorms and dining. As a key facet of its innovative and liberal arts-based curriculum, Philander Smith College encourages undergraduate students to participate in research opportunities, experiential learning, and study abroad experiences. Students can choose from 20 degree programs across five core departments, including business and economics, education, humanities, social sciences, and the natural and physical sciences. Philander Smith's renowned Social Justice Institute, one of the only of its kind amongst all top-ranked Arkansas colleges, is undergoing a strategic rebranding--Think Justice 2.0--and is scheduled to launch with new initiatives in spring 2017. Philander Smith's affiliation with the United Methodist Church is integrated into the campus' culture, with events and programs like Religious Life Council and the Chosen Generation Gospel Choir. The college's Center for Student Services provides student-centered resources, including career services, first-year peer mentoring, living and learning initiatives for success, health and counseling services, and more. The University of Arkansas at Monticello (UAM) offers a diverse selection of bachelor's degrees in the arts and humanities, sciences, business, and education. Whether interested in nursing, music, or biology, students are bound to find a degree path that fits their academic or career interests at one of the best colleges in Arkansas. An average enrollment of just over 3,600 students allows for a small student-to-faculty ratio of 17:1 and more engaging classroom interactions. The college's athletic teams--which include women's and men's basketball, cross country, golf, and more--compete in the NCAA Division II conference. Intramural and special sporting events, like free throw shooting tournaments, are held throughout the year. In recognition of the university's respect and commitment to its wooded surroundings, UAM has won the Tree Campus USA Program award for environmental stewardship for the last six consecutive years. A diverse set of student organizations offer students many other ways to get involved, from Debate Society to ROTC to Greek life. Students at community colleges come from all backgrounds and have very different academic goals. Many students are preparing for a four-year program, while others want to complete an associate degree or obtain a technical certificate. Tuition and fees tend to be lower in community colleges and students can save plenty of money taking prerequisites at a two-year school. Arkansas's two-year schools educate thousands of students across more than 20 campuses. Below, we've ranked the top two-year programs in the state. Cossatot Community College of the University of Arkansas offers associate degrees that can easily be transferred to places like Southern Arkansas University and other four-year schools. Students can also choose to earn one of several skilled and technical degrees from one of the best community colleges in Arkansas, with programs ranging from radio broadcasting to welding. Cossatot offers a number of affordable and convenient services that are open to both students and the public, including the Healthy Connections Clinic, the Campus Corner Café (where students receive a 50% discount), a Virtual Career Center, and full library and tutoring services. All students also receive free access to the Microsoft Office 365 cloud software suite. Cossatot offers some tuition waivers for qualifying students, as well as institutional and foundation-funded scholarships. A textbook rental program and wide use of free and open educational resources also helps students save on educational costs. University of Arkansas Community College-Batesville (UACCB) is part of a network of Arkansas community colleges that awards AA, AS, and AAS degrees, with six transfer program options available in the following areas: general education, elementary education, pre-engineering, STEM, business, or criminal justice. AAS degrees offer a more direct path into the workforce in public service, business, technology, education, or healthcare, with options like entrepreneurship or emergency medical technician with paramedic certification. All transfer programs include core ACTS courses in the arts, humanities, and math and sciences. UACCB's Batesville Foundation provides students with access to over 30 scholarship opportunities totaling over $1 million. In addition to traditional academic resources, students have access to Structured Learning Assistance, which offers enrollment in targeted workshops that help students succeed in passing tough subjects. Students can get involved on campus through a number of organizations that include the Phi Theta Kappa honor's society, the service-oriented Circle K International, the Non-Traditional Student Organization for adult students, and several others. University of Arkansas Rich Mountain is included in our list of best community colleges in Arkansas, offering both transfer-friendly AA degrees, as well as technical and occupational degrees, including and AS in general technology degree. AAS degree options include programs in business administration, information technology, office technology, or registered nursing. Students who qualify for the Career Pathways program receive added resources to help them succeed in completing their degree, including things like reduce rates for child care, free tutoring, tuition assistance, and much more. Other comprehensive services open to all students include the Mountain Range Grill, an on-campus preschool, full library resources, and a variety of student organizations. Located in scenic Mena, Arkansas, Rich Mountain is an ideal jumping off point for numerous hiking and ATV trails, canoeing and kayaking, golf, fishing, and other outdoor activities. More than half of Mena's student body attends school part-time. Mena offers small class sizes with an average of 11 students per instructor, and classrooms are equipped with the latest presentation technology. Arkansas State University-Mountain Home (ASUMH) degrees are offered through three schools: the School of Arts & Sciences, the School of Business Technology, or the School of Health Sciences. Out-of-the-box degree programs include an AAS in funeral science, which focuses on the theory and practical science behind the funeral service profession, or an AS in agricultural and natural resources, with a business and scientific perspective in addressing issues faced by natural resource agencies and agribusiness organizations. A variety of other degrees in the arts, sciences, and technical fields are also available. ASU's Fran Coulter Honors Program, a highlight amongst other Arkansas community colleges, offers high-achieving students the opportunity to learn and work directly with a select set of faculty members in and outside of the classroom. ASUMH maintains a partnership with the Arkansas Career Coach Program to offer students one-on-one career counseling and access to statewide resources. Interested applicants can reach out to a dedicated a student recruiter by email or schedule a visit to campus. Many of North Arkansas College (Northark) programs are offered in some of the most state-of-the-art facilities that can be found amongst two-year colleges in Arkansas. An associate degree in agriculture, for examples, offers hands-on learning opportunities in the campus' feature high tunnel and modern greenhouses. The agriculture program also offers an Agri club with scholarship opportunities for members who earn high points through a unique points system. Other AA and AS degrees, which require require 60 hours of coursework, are suitable for transfer to a bachelor's degree program, while career-oriented AAS degrees range from 60- to 72-hour credit requirements. AAS degree options include an IT program with concentrations in digital media, network administration, or software development. Northark maintains close connections with organizations in the community, such as the North Arkansas Partnership for Health Education--a nonprofit agreement that provides services like certified nurse training, parenting classes, and a prevention resource center to community members. A thriving athletics program includes a booster club and athletics hall of fame that recognizes accomplished student athletes in basketball, baseball and softball. As one of the best community colleges in Arkansas, Arkansas Northeastern College provides access to both technical and professional programs, as well as foundational two-year degrees in preparation for a state-based bachelor's program. ANC's main academic divisions include allied health, allied technologies, and the arts & sciences. Many programs offered at the college can be the ideal option for transfer students, with degrees offered in the humanities, education, fine arts with a focus in music, and math & sciences. Students complete both liberal arts and community interest courses, such as African-American literature or community choir. AAS degrees are available in an array of career-oriented fields such as steel industry technology, aviation maintenance, and early childhood education. ANC currently offers the lowest tuition in the state of Arkansas. A diverse student body includes 30% who identify as minorities with an average age of 28. ANC's University Center is a new collaboration with four state universities that allows these schools to offer bachelor's and master's degrees on the ANC campus. Students at Arkansas State University-Newport (ASU-Newport) can choose an associate degree that transfers to a four-year program or a technical or career associate degree in a variety of fields. All degrees require a minimum 35-hour core curriculum that is part of the Arkansas Course Transfer System (ACTS) and is an easy transfer to participating Arkansas universities. ASU-Newport offers program-specific degrees that transfer to particular schools, such as the AS in education with transfer to University of Central Arkansas. ASU is one of a few two-year colleges in Arkansas to also provide an AA in liberal arts that qualifies for transfer to any participating university statewide. Technical and occupational degree options include but are not limited to advanced manufacturing, cosmetology, and surgical technology. Since its founding in 1976, ASU has grown from one to three campus locations and began offering Higher Learning Commission (HLC)-accredited degrees in 2006. ASU offers a both merit and academic scholarships, including an Incentive Scholarship based on incoming students' academic performance and a program-specific scholarship for students entering the hospitality program. Students at Phillips Community College of the University of Arkansas can choose from a comprehensive set of associate degrees in the arts and sciences, as well as technical AAS degrees. Innovative programs include an AA in English, speech, and drama; an AS in chemistry and pre-med; or an AAS in behavioral health technology. PCCUA is also one of the only community colleges in Arkansas to maintain a partnership with Arkansas' Criminal Justice Institute, and offers associate degree pathways in crime scene investigation or law enforcement administration. New students can earn college credit for passing Advanced Placement (AP) exam scores in a number of subjects, including calculus and English. Students can take advantage of on-campus resources like free individual and group tutoring and study labs, TRIO support services for first-generation college students, and special career pathway services for qualifying students. Intramural activities--including volleyball, flag football, disc golf, and more--are open to students interested in staying active and connecting with peers on campus. Students at University of Arkansas Community College-Morrilton (UACCM) can choose from a full selection of associate programs, including transferrable AA and AS degrees in liberal arts or general education. A wide variety of AAS degrees in technical, business, health, and other service-oriented areas are also available to students planning to directly enter the workforce. Unique amongst Arkansas community colleges is UACCM's annual transfer fair, where representatives from almost all four-year institutions in the state are present to meet with students, provide information on programs and answer student questions. UA's intramural sports teams are open to all students, and the college also maintains a disc golf court, a full-size basketball and volleyball court, a fitness center, and a student union with lounge area and flat-screen TV's. Students and faculty also receive local business discounts on products and services like AT&T wireless plans, Coastal eyewear, Scuba School classes, and much more. Black River Technical College's direct transfer degrees allow students to complete an AA or AS degree program, with seamless transfer to a specific four-year partner university. Example transfer options include an AS in entrepreneurship in partnership with John Brown University, an AS in nursing with a choice of transfer schools (including University of Arkansas or Arkansas State Tech), or an AA in general education transferable to most public universities throughout the U.S. Many other colleges will take students who choose a specific-transfer degree program, as long as other course requirements are met. In addition to students clubs, Black River maintains its traditional annual events and activities, such as the Got Talent show and its Fun Before Finals events. Students artists and authors can also submit their best work to the Currents Creative Arts Journal, a unique publication from one of the top two-year colleges in Arkansas. Other opportunities for student engagement include short-term study abroad trips to places like Eastern Europe and New Zealand. Included in our best community colleges in Arkansas, NorthWest Arkansas Community College (NWCC) has partnered with a number of leading four-year state universities, including University of Arkansas and Hendrix College, to ensure its associate degree programs offer a smooth transfer into a bachelor's-level program. Degree plans include a choice of AA, AS and associate of fine arts (AFA) degrees in programs ranging from creative writing to agriculture to food & life sciences. Students can also opt for a career-focused AAS degree in a variety of fields, including business, construction technology, computer information, criminal justice, education, culinary arts, legal, healthcare, and several other domains. NWCC offers students short-term study abroad opportunities to destinations that include Thailand and Greece. A diverse set of student clubs and organizations, including the Art Club, the Black Student Association, and the National Society of Leadership and Success, offer students the ability to connect with peers from different backgrounds. A variety of other ongoing campus events, such as Pizza with the President, provide additional opportunities to stay connected with peers and faculty outside of the classroom. Located in Malvern, Arkansas, College of the Ouachitas (COTO) provides degree programs for students of all ages, including high school students who want to get a headstart via the college's Dual Enrollment Accelerated Learning program. COTO also hosts a newly-created Honors College, offering eligible students more rigorous course options and special electives that transfer to their choice of bachelor's degree program. All programs are awarded an AA in general education, with a diverse set of arts and science concentrations available for students transferring to four-year universities. Technical and occupational programs--including criminal justice, mechatronics, or medical office administration--result in an Applied Science Technology (AST) degree or an AAS and prepare students for immediate entry into a career. COTO was one of 14 colleges nationwide recognized in 2012 as an Achieving the Dream college, awarded to schools who demonstrate efforts to close achievement gaps and increase graduation rates. In an another outstanding recognition amongst Arkansas community colleges, COTO was awarded the Governor's Quality Award in 2015. Southern Arkansas University Tech (SAU) offers a diverse selection of two-year degrees, with five transfer options and many more career-oriented degrees, including business, healthcare, IT, industrial domains. A selection of specialized career paths like wildlife & fisheries enforcement or fire emergency and response are also available. Other unique options at from one of the best community colleges in Arkansas include a simulation & game design or a degree in automated & robotic engineering, also available as a transfer degree. Other transfer options include teacher education, welding, business administration, or general studies. SAU Tech also maintains partnerships and programs with the Arkansas Environmental Trading Academy and the Arkansas Fire Training Academy. In addition to a Student Center equipped with academic resources, students can check out the Activity Center with video games, pool tables, a fitness center, and more. The campus also hosts outdoor basketball and volleyball courts, lighted tennis court, and a golf course. Budding entrepreneurs can take advantage of services through the SAU Entrepreneurship Center, which offers everything from consulting to an eCommerce incubator. University of Arkansas Community College-Hope (UACCH) provides a diverse selection of technical associate degrees, with innovative options like medical office management, power plant technology, and human services. UACCH offers student organizations that enrich the classroom experience and offer opportunities to connect with other students and faculty, with options like Student Government, the Multicultural Club, Shooting Sports Club, and many more. UACCH enrolls over 1,200 students annually, with an average class size of 14 students. UACCH is one of several top community colleges in Arkansas to offer a streamlined partnership program, and the community college's ongoing relationship with University of Arkansas allows students the option of completing one of three bachelor degrees, including a BS in construction management. The college has implemented several services to help students succeed, including unique in-class tutoring, which pairs students with a tutor who participates in a student's lessons and regularly meets with a student's professor. In addition to a versatile AA in general education and liberal arts, students at Ozarka College can choose from a transferable AS in six different areas, including a degree in aviation for professional pilots and the college's newest degree in agriculture. Career-oriented AAS degrees are also available in six employable fields, and Ozarka is one of the only community colleges in Arkansas to offer a degree in general technology, which helps equip professionals with a diverse set of skills that might otherwise not be met through a single technology program. Students may be eligible to receive prior learning credit, up to 25% of the credits required for program completion. Ozarka has made efforts to ensure the wellbeing of its students and faculty that include transitioning to a tobacco-free institution and maintaining a fitness center with group classes. Students also have access to support services like counseling, professional workshops, and peer tutoring. Students looking to attend one of the top-ranking two-year colleges in Arkansas will find a variety of career and higher-education pathways at Arkansas State University-Beebe (ASU), with AS and AA degrees that transfer to a four-year program, as well as a selection of career-oriented AAS degrees like hospitality administration or computer aided drafting and design. New students participate in a 3-hour orientation session, providing students with a dedicated time to register for classes and meet with their advisor. ASU-Beebe offers students the opportunity to live on campus in one of two residence halls, each staffed with a full-time professional Hall Director. Both commuter and residential students have access to an on-campus dining hall, library, and student center, which houses the bookstore, offers free wifi, and provides information on a variety of cultural, educational and cultural events on campus. Prospective students can sign up for a Preview Day and take a tour of the campus, meet with academic faculty, and a eat complimentary lunch at the University Café. Mid-South Community College's HLC-accredited associate degree programs are offered in a variety of industry-specific and innovative areas, including digital media, hospitality management, and machine technology. General education core classes are transferrable to most four-year colleges in the U.S., with Mid-South graduates having transferred to over 170 different institutions across the country. Students will find organizations and clubs that meet a variety of interests, from sports to leadership to ministry. Student athletes and sports fans can also express interest in recruitment or attend games and cheer on Mid-South's “Greyhound” men's and women's basketball teams. As one of the top two-year colleges in Arkansas, Mid-South makes efforts to host ongoing events throughout the year, such as an annual talent show, a math contest with opportunities to compete at the state level, and volunteer projects at community institutions. Students at East Arkansas Community College (EastArk) offer a number of associate degrees in health science; business and technology; the humanities; mathematics; and social and life sciences. East Arkansas is unique among other community colleges in Arkansas for its strong partnership with Arkansas State University; a streamlined transfer process helps ensure that students who meet core requirements enter their chosen bachelor's degree program as a junior. EastArk's new East Initiative features a state-of-the-art technology lab, where students have the chance to create unique projects for select classes using innovative software like virtual reality and hi-tech animation. The college's Secondary Career Center is another unique facility created for high-school students looking to gain hands-on training and earn early college credit. Students interested in hands-on service might also consider involvement with EACC's Literacy Project, which trains volunteers to tutor ESL adults and those with low-reading levels in a small group or one-on-one setting. One of the top-ranking two-year colleges in Arkansas, Remington is a non-profit school offering career-focused programs to first-time and nontraditional students. All locations, including the Little Rock campus, host a Career Services center with staff who help with professional development and connect students with local employers. Business programs can be completed in less than two years, and opportunities for externships are available to students who maintain a qualifying minimum GPA. Remington College's programs all consist of an advisory panel, made of up local employers, who help integrate hands-on employer-level training with simulated real-world settings in the classroom. Degree options include an AA in criminal justice or associate in business administration degrees with a concentration in bookkeeping, marketing & sales, or executive assistant expertise. All degrees are accredited by the Accrediting Commission of Career Schools and Colleges (ACCSC). Remington offers both a merit- and needs-based scholarship annually to qualifying students. Each of National Park College's seven academic divisions offer numerous associate degree options, and each department includes at least one transfer option to any university in the state. Transfer degree choices include but are not limited to an AS in elementary, middle, or special education; an AS in medical laboratory technology; or an AAS in computer programming. Other divisions, like math & science, offer students the opportunity to individualize an associate degree path that meets the transfer objectives of a specific university. National Park's AAS degrees are also the ideal option for students who want to directly enter the workforce. Students who are unsure of which degree path to take are encouraged to work closely with one of National Park's counselors to develop an individualized degree plan. In 2016, National Park opened its new Innovative Technologies Center, which offers specialized training and resources in IT and coding, advanced manufacturing, and healthcare, an initiative that adds to its reputation as one of the top community colleges in Arkansas. South Arkansas Community College (SouthArk) makes the list of best community colleges in Arkansas, offering transfer degrees in the sciences, liberal arts, and business, as well as a variety of occupational degrees. In addition to 14 health science programs like physical therapy and emergency medical technology, new programs include a degree in performance and media arts or in medical laboratory science. SouthArk also offers Career Pathways programs for qualifying students, helping provide students who are disadvantaged with the resources they need to complete one of several degrees in less than a year. Students in SouthArk's honor's programa participate in enriched courses, field trips, individual mentoring, and are automatically accepted into the honors college at Southern Arkansas University. Real-world experience can also be found through one of the college's internship programs, which provides students with paid or unpaid experiences in a variety of fields. Pulaski Technical College recently became the most recent of several two-year colleges in Arkansas to join the University of Arkansas system, a connection that offers additional resources and opportunities for students and faculty. Students can choose from a diverse set of transfer AA and AS degree plans or choose a technical- or occupational-oriented program that leads to a career right after graduation. Courses are offered at a variety of times during the day and evening to accommodate a mix of student schedules. Pulaski Tech, located in northern Little Rock, has roots dating back to 1945, and the college became part of the Arkansas Technical and Community College System in 1991. Pulaski enrolls over 6,500 students annually, with students ranging in age from 14 to 76. About 57% of students work part-time and 65% are enrolled in a general education transfer program with plans to complete at least a bachelor's degree. Baptist Health College-Little Rock is one of the only Arkansas community colleges to specialize in healthcare programs, offering nine distinct AAS degrees designed to prepare students for immediate careers in their field. Cutting-edge options include histotechnology, which involves preparing tissue for microscopic study by pathologists; nuclear medicine technology; and sleep technology, involving the diagnosis and treatment of sleep disorders. All applicants complete an interview with a program selection committee as part of the application process. Baptist Health works to make sure that its students have as many resources as possible for success, including access to an on-campus pre-school with discounted rates, free Microsoft Office software and IT services, access to an academic and spiritual counselor, carpool options, and much more. Students from Baptist Health are continually recognized by employers and institutions for their professionalism, evidence by the school's recent award of a Blue Cross Blue Shield-endowed scholarship in honor of its students' professional commitment. Southeast Arkansas College's (SEARK College) motto “Two Years Here...A Career Forever” reflects its commitment to preparing students with the skills and knowledge necessary to thrive in their chosen career field. In addition to SEARK's transferable AA, AGS, and AS degrees in business, students can choose from technical AAS degrees in respiratory therapy or nursing. A full set of academic support services at one of the best community colleges in Arkansas include a tutoring center, special Career Pathways resources, computer labs, a Barnes and Noble bookstore, and more. Nontraditional adult learners may be eligible to earn credit for prior life experience or training, including military service. Students can get involved on campus through a number of clubs and organizations, with choices like the Gaming Club, Student Ambassadors, or academic groups such as the Student Nursing Association. All SEARK degrees are accredited by the Higher Learning Commission. Shorter College is a private, two-year college and one of the oldest community colleges in Arkansas, founded in 1886 by the African Methodist Episcopal Church. Though the college opens its doors to students of all ethnicities, it continues its tradition of helping develop African American leaders in the community. Though its enrollment is small at just over 400 students, Shorter is one of the fastest growing community campuses in Arkansas. Students can choose from one of three versatile associate degrees: an AA in general studies, with available concentrations in church leadership and ministry or childhood development; an AA in criminal justice; or an AA in entrepreneurial studies. Shorter also offers a number of special programs, including early dual enrollment for high-school students, as well as the ANCHOR program, which recruits individuals in parole or probation programs and supports them in completing their college education. All degree programs are accredited by the Transnational Association of Christian Colleges and Schools. In an effort to set positive examples and provide needed resources for students, Shorter officially became a tobacco-free campus in 2016 and also opened its new health and wellness center to students, faculty, and the surrounding community. If you're thinking about applying to one of the best colleges in Arkansas, continuing reading to learn more about living in the Natural State. Arkansas is known for its agriculture, paper and wood products, along with its aluminum and diamonds. The state covers 53,182 square miles and has a population of just under 3 million people. With low tuition rates and prestigious universities, prospective students are attracted to Arkansas's postsecondary schools. The job climate in Arkansas is improving. The unemployment rate throughout Arkansas is down to just over 5%, and it's also one of the most affordable states in the country. With plenty of natural beauty and a few thriving cities, Arkansas offers residents a variety of settings to live in. Attractions: William J. Clinton Presidential Center, Verizon Arena and the Dickey-Stephens Park. Popular Schools: University of Central Arkansas, University of Arkansas at Little Rock. Major Cities: Jonesboro, West Memphis, Newport and Helena-West Helena. Attractions: Crowley's Ridge Parkway, Arkansas Blues & Heritage Festival and the World Championship Duck Calling Contest. Popular Schools: Arkansas State University, Phillips Community College of the University of Arkansas. Major Cities: Fayetteville, Rogers, Springdale and Bentonville. Attractions: National Register of Historic Places, Reynolds Razorback Stadium and the Scenic Byway 7. Popular Schools: University of Arkansas and University of the Ozarks. Establishing residency allows students to access in-state tuition in Arkansas's public colleges. Students over 18 must provide proof of state residency; minors must reside with either a parent or guardian to qualify for the reduced tuition. Minors must live with a parent or guardian in Arkansas to establish state residency. If the student's parents are divorced or separated, the minor must live with a parent in Arkansas. Minors must provide evidence that they lived with their parent in Arkansas prior to their 18th birthday and prove their intention to continue living with that parent until starting school. You must live in Arkansas for at least one year prior to declaring residence. You must prove intent to make Arkansas your permanent home. You must prove your financial independence. Adults under age 23 may need to formally declare emancipation from their guardians.